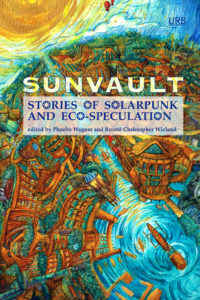 It’s publication day for Sunvault: Stories of Solarpunk and Eco-Speculation! Edited by Phoebe Wagner and Brontë Christopher Wieland, Sunvault is the first English-language anthology to broadly collect solarpunk short fiction, artwork, and poetry. Focusing on solutions to environmental disasters, solarpunk is a revolution against despair. Contributors include Elgin Award nominee Kristine Ong Muslim, New York Times bestselling author Daniel José Older, James Tiptree, Jr. Award winner Nisi Shawl, World Fantasy Award and Campbell Award winner Lavie Tidhar, Lambda Literary Awards finalist A.C. Wise, and Jess Barber, Santiago Belluco, Lisa M. Bradley, Chloe N. Clark, Brandon Crilly, Yilun Fan and translator S. Qiouyi Lu, Jaymee Goh, José M. Jimenez, Maura Lydon, Camille Meyers, Lev Mirov, joel nathanael, Clara Ng, Sara Norja, Brandon O’Brien, Jack Pevyhouse, Bethany Powell, C. Samuel Rees, Iona Sharma, Karyn L. Stecyk, Bogi Takács, Aleksei Valentín, T.X. Watson, Nick Wood, and Tyler Young. Illustrations by Christine Moleski, Clara Ng, Sireesha Reddy, Carlin Reynolds, Bogi Takács, and Leigh Wallace. Cover artist Likhain is a Filipina artist who received the 2016 Tiptree Fellowship and was nominated for a 2017 Hugo Award for Best Fan Artist. Entry filed under: Uncategorized. Tags: publication day, solarpunk, sunvault.